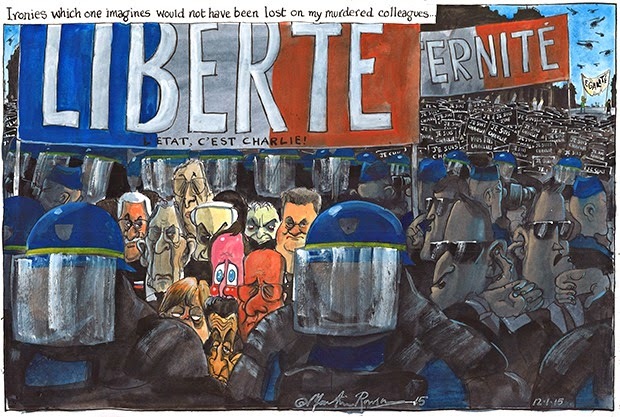 Cartoon from Martin Rowson of the Guardian with the riot police setting the limits on free speech! It must have caused Cameron to choke. The very idea of liberty, equality and fraternity is anathema to this political opportunist without an original idea to his name. 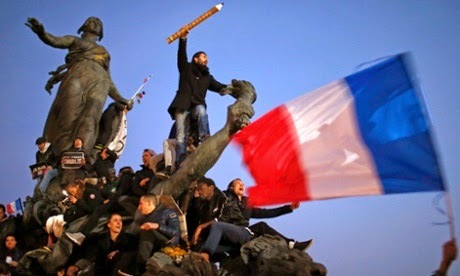 But the millions who marched in Paris and France today were not marching against ‘terrorism’ but against racism and anti-Semitism and in support of the unity of peoples and the rights of free speech. Terrorism covers both the US created butchers in ISIS and Al Qaeda and Hezbollah in Lebanon and Hamas in Gaza, who have both condemned the murders at Charlie Hebdo. ‘Terrorism’ was the label applied to all movements for colonial liberation, from the ANC in South Africa to Sinn Fein in Ireland. It conveniently excludes the biggest terrorists of all – governments who hold nuclear weapons, who wage war killing hundreds of thousands, who torture and maim with gay abandon. But the issues are not easy, as the cartoon reproduced from the Guardian makes clear or the anti-Semitic cartoon from Julius Streicher’s Der Sturmer should make clear. Where does the right to free speech become the right to injure and hurt and worse? Guardian cartoon - the limits of satire? What is termed ‘free speech’ is often anything but free. It can come at a heavy cost. Julius Streicher was hanged, quite rightly, at Nuremberg after the war for crimes against humanity. The extermination of the Jews took place to a background of pornographic anti-Semitic imagery. Likewise the lynching of Blacks in the American South was accompanied by similar racist imagery. I think we can clearly state that cartoons or drawings that depict some members of humanity as sub-human, that seek to make the equation between for example mad, bad Irishmen and psychopathic thugs who have the temerity to challenge the benign English occupation have no place in civilisation. In short imagery that seeks to incite racial hatred or perpetuate it has nothing to do with free speech. On the other hand the right to criticise religion and religious practices is a right of any free society and any religious bigot who objects should cast his/her mind back to the times when Christianity and the Inquisition set the limits on free speech (or indeed Protestant or Rabbinical tyranny). And speaking of bigots and racists then the appearance of Benjamin Netanyahu today was fitting. What are the demands of anti-Semites? 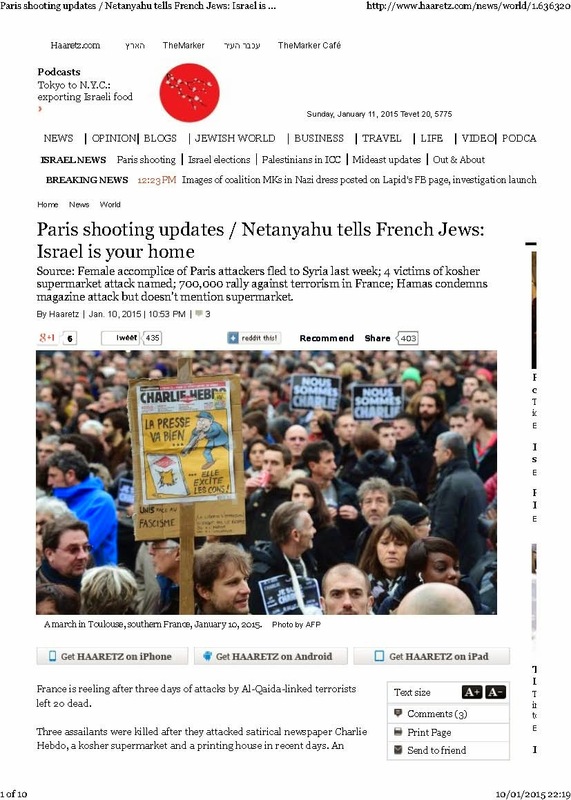 That Jews don’t belong in France (Britain, Argentina etc.) and should go to ‘their’ state Israel in which they too can kick a few of the colonised around. Once again Zionism and anti-Semitism hold hands in unison, conveying the same message. A necessary Jew in France today should be proud of the fact that nearly 4 million people came out to reaffirm the anti-racist message and to say Jews are welcome in France compared to the one thousand who attended Marie Le Pen’s rally and the 3 racist idiots who met a deserved death on Friday.